Bernie, with help from Grand Prix rider Sarah Baldwin, shows how a seemingly basic vertical to vertical in-and-out becomes a sophisticated schooling tool when ground lines are artfully and strategically used to enhance your horse’s negotiation of a double. The helmet Bernie is wearing in this video is provided by Antarès-Sellier France. Equine activities can be hazardous and may subject participants to injury. 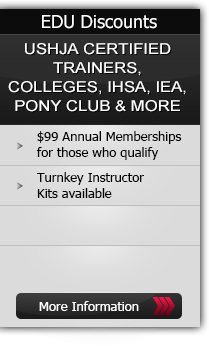 Neither Equestrian Coach, LLC nor Bernie Traurig assume liability for your activities. This program provides general instructions and techniques that may not be suitable for everyone. No warranty is given regarding suitability of these instructions to the viewer. Get instant access to hundreds of videos with your annual or monthly subscription. Take advantage of the insight and expertise provided by our Olympic, Championship and World-Class riders, trainers and professionals. We are available anywhere, anytime - watch on the go from most tablets and mobile devices. With new topics added every month to our already large video library, EquestrianCoach is the premier source for equestrians to take their riding and training to the next level. Click here for complete details on our subscription options. Videos purchased on a pay-per-view basis never expire and you can watch as many times as you like online.